According to the latest government figures, there were over 5.5 million private sector businesses in the UK. The TALL Group produce special cheques for many of the major UK high street banks, liaising with bank contacts and their corporate customers to provide a special cheque and credit service. The Group companies will guide bank customers through the process of ordering business cheques and ensure that they meet individual bank guidelines. TALL design and provide secure cheque printing for cheque book and computer cheques, in a range of formats and sizes (including A4 laser and continuous cheques), and a choice of background designs to suit customer requirements. Fully bespoke designs, incorporating unique overt and covert security features are also available. All formats and sizes are available for credits and paying in slips including special code lines that incorporate OCR and/or MICR. TALL can also design and print letter and remittance credits. With fully trained customer service centres at all three TALL Group sites, experienced in liaising with both bank and corporate customers TALL can manage bank customers’ special cheque and credit service requirements directly. 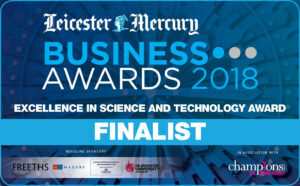 The Hinckley-based company has been shortlisted in the ‘Excellence in Science & Technology’ category ahead of the ceremony on 12th April after being nominated once again for a Leicester Mercury Business Award. Checkprint’s Hinckley site, whilst remaining a key print resource within the TALL Group, has also seen major investment in new IT equipment and infrastructure to support this new cheque imaging product line extension. 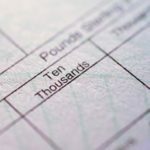 The company has – through major contracts with several major banks – already provided over 5,000 cheque scanners into the new imaging market sector. Tributes have been paid to one of the founders of a Runcorn-based printing firm who has retired after 27 years with the organisation. Phil Long is looking forward to spending more time with his family after retiring from his role as Group Production Director at the TALL Group of Companies. In 1990, Phil was one of the driving forces behind the creation of TALL Security Print, whose premises are located in Manor Court. 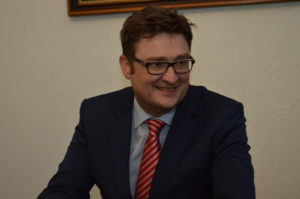 Nine years later the company acquired Hinckley-based Checkprint to create the TALL Group, which later acquired the Northern Irish printing specialist DLRT Ltd in 2015. Phil spent almost three decades overseeing the production departments and a total of 50 years working within the print industry. 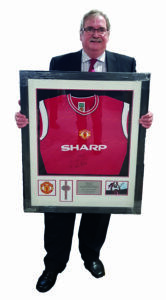 On his last day at the company, Phil, who lives in Urmston, was presented with a framed shirt of his favourite football team Manchester United, signed by former player Norman Whiteside. Following Phil’s retirement, Ed Starkey, who himself is enjoying his 26th year at the company, has been appointed Operations Director for the Runcorn operation. Ed, who lives in Widnes, joined TALL Security Print as a Small Offset Printer, where he supervised a single-colour printing press. Various promotions over the years saw Ed managing a range of larger machinery, including the multi-colour continuous web presses.